St. Henry turned in a lionhearted performance against Covington Catholic, winning in an overtime shootout, 3-2, to claim the 9th Region Boys Soccer Championship at the Highlands soccer field on Saturday night. The game had a kind of old world feel to it as the calmer crowd sat up on the grassy hillside and the crazed student sections packed in below. Both sides were spirited and raucous, but it was the Crusaders supporters that ended up flooding the field upon the dramatic finale when Austin Langen blasted his penalty kick into the net. For much of the game it looked like it was only a matter of time before Cov Cath would squeeze the remaining air out of the Crusaders' chances and roll to win. Up 2-0 at halftime and 3-1 well into the second half, the action had a sense of expectancy that it would continue to go the Colonels way. When Calvin Neltner slimmed the margin to 3-2 with a goal, the door of opportunity cracked open just enough to turn the Crusaders energy from defeated to desperate and a new rigor came over the St. Henry players and their fans. Then, with under two minutes left and still behind a goal, St. Henry set up for a free kick near midfield. The ball was delivered well into the box, a Crusader headed it and deflected off of the goalkeeper, then Adam Lannon headed it himself to equalize the game a the 3-3. The surge of confidence that the Colonel Crazies had preserved for their team for 58 minutes, tidal-waved over to the red side of St. Henry. The two five-minute overtime sessions were tense but fruitless. Throughout the whole game, the Colonels far outnumbered the Crusaders for shots on goal and pressed the St. Henry defenders throughout the whole affair. In a sense, one could say that Covington Catholic outplayed their opponent for the vast majority of the game, but it was losing a just a few key moments that led to the loss as a whole. The cramping for the players was also becoming a real problem at this stage of the game. Both teams had guys limping all over the place and any time they weren't running, they were trying to stretch their muscles out. It had already been a classic game. It didn't need a thrilling overtime shootout, but the fans were treated to one, nonetheless, because there could only be one champion of the 9th Region. First kicking was Joe Schuh who missed wide right. For maybe the first time all night, real panic set in for the Colonels. Schuh looked devastated coming off of the field and his teammates rallied to his support. Next, Dehner confidently scooted one past Zach Stetter and really gave the Crusader faithful something to cheer about as they took their first lead. The pressure fell on to Patrick Ballow who responded well with the Colonels first shootout goal. Tying the round, 1-1. Then Adam Lannon made his as well, giving St. Henry the lead again. Cov Cath junior George Ghazala was next for the Colonels but had his attempt blocked by Tanner Koking, who gave Ghazala the Mutombo finger wag after deflecting his shot. Colonels goalie, Stetter, rose to the challenge on the next St. Henry attempt, however, as he himself blocked a goal away and kept his team hanging on. Then came a little controversy. Brice Day struck that ball and it hit the crossbar and bounced directly down to the ground. The St. Henry crowd went nuts, thinking it was another miss. The Cov Cath sideline went nuts, thinking the ball had crossed the line when it hit the ground. The referee said it was no good, and it all seemed to come down to the next kick by St. Henry's Calvin Neltner. But, no! Stetter blocked yet another attempt, showing any doubters why he was brought in just for the penalty kick sequence of the game. Parker Kenney responded with a make, tying it 2-2. The whole game, the whole region came down to the next kick. 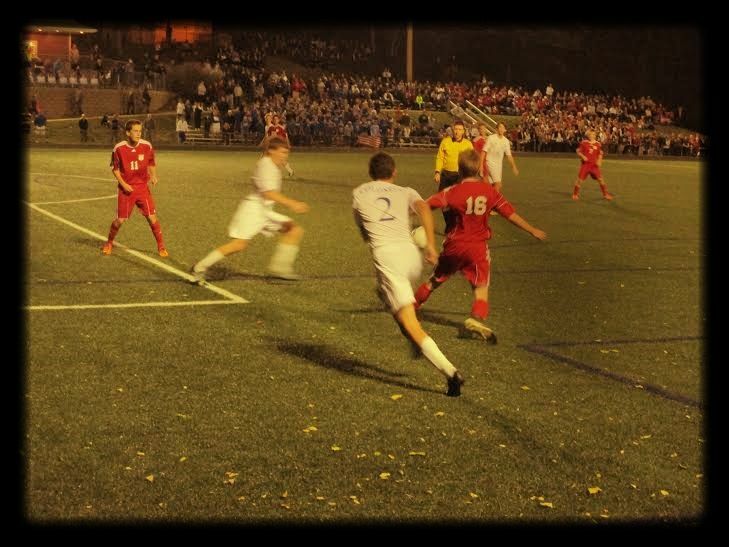 Austin Langen lined the ball up, kicked off the back of the net, and the Crusaders became regional champions.